Omakase (お任せ) is a phrase that literally means "to entrust". Means, when you order Omakase at a Japanese restaurant, you are entrusting the chef to prepare your meal at his whim; from appetizer to dessert. He will then select the freshest local/seasonal ingredients-of-the-day and arrange them into sequence, giving you a special dining experience, featuring both hot & cold dishes that demonstrates the diversity of authentic Japanese cuisine. Typically you can enjoy Omakase at any tables or at the Sushi Bar, but I'd recommend the latter one just so that the chef can serve the meal right in front of your seat. 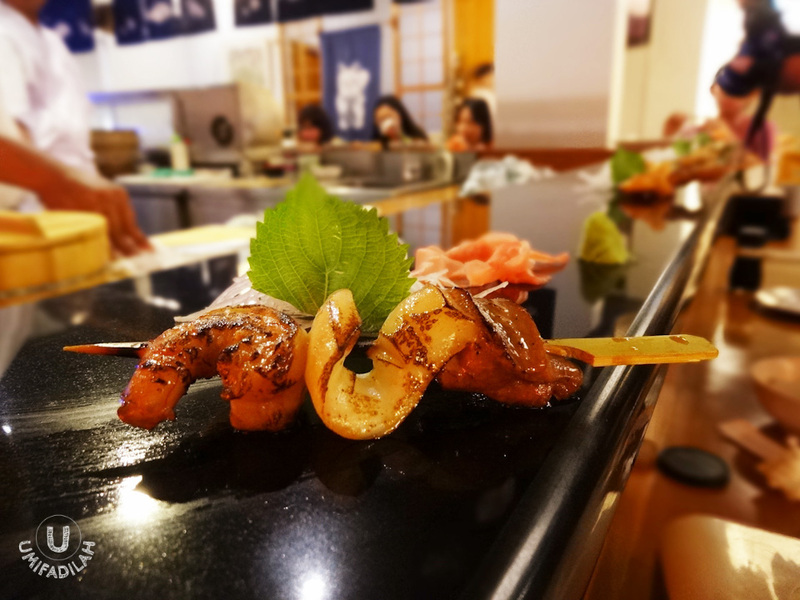 The whole experience just got personal and you can see how your food is being made through the sharp sushi-knife and the super-skilled chef's hands. We started off with this light appetizer. I have always been a big fan of Umaku's signature salad dressing, so I can't complain one bit about this dish :) A good start. A bad photo. Sorry about that, guess I was too hungry! Hang on, still the 2nd course ~ no surprise here. We all know how salmon tastes like. But I swear this one was very fresh! What it supposed to look like ~ this is what others had. Natto, maguro, wakegi, nori, drenched in light shoyu. My special request - I skipped the natto. Hehe, tasted super! Of course. Chef Syaiful preparing mekajiki cuts for our 4th sashimi course. More cuts, please! 3 cuts were never enough. I guess it was my first time eating raw swordfish. Mekajiki flesh isn't as delicate as salmon, also not as fatty as maguro, but it has solid texture and slightly thick 'crunchy' flesh. Now, there are moments in a food-blogger's life where she thought her palate already tasted the best of the best, but then she keep getting surprised as she discovers a BETTER version of the best. Yes, I'm talking about squid sashimi. Let me describe more. This was, one of the most memorable thing that got into my mouth that night. We all know how squid tastes like, but very few enjoy raw fresh squid. HINT: IF IT'S HANDLED SKILLFULLY, IT JUST MELTS IN YOUR MOUTH. Who knew raw squid could taste and have texture as delicate as young coconut? The technique was to make sure to remove all of the squid's outer cuticle layers. (in Bahasa Indonesia we call it "kulit ari"). Usually the hardest one to remove is the last invisible layer, but the trick is to use paper cloth to pat dry and repeal its super thin membrane. I can't thank the chef enough for this one, too good! THE BEST RAW SQUID I'VE EVER EATEN. Now it's time for yakimono (grilled) type of dishes. We had huge shrimps, squids, and fatty tuna grilled on a stick! Couldn't ask for a better one. Cold dish, anyone? The unique thing about this dish is that the noodles uses pure rice flour, not buckwheat as used in soba or other typical Japanese noodle. Dipped in cold shoyu broth with grated ginger, nori, and wakegi, we slurped it right away, til the very last drop. The next dish is what surprised us the most. This is the one that I've never eaten before. When it came, we all thought that this was chunks of beef ribs in herb aromatic broth (we thought of Konro Makassar at the first glance), but turns out Akami Nimono is tuna fin soup in a light shoyu and fish stock, and sprinkled with finely chopped wakegi on top. Akami: red meat part of tuna, Nimono: soup. The type of tuna is also what surprises us. Chef Uki says that he had to prepare the meal days before, and it only uses giant tuna with over >150kgs in weight (I'm guessing it's a blue fin tuna?). So yes, we tasted tuna in its best & most unique form, and we had no regrets. I'M TELLING YOU, THIS... WAS THE CHAMPION COURSE OF THE NIGHT! At this point right after, we were served authentic sushi of 8 different types. And just like what I've seen in sushi documentary film, Jiro Dream's of Sushi, this is how sushi connoisseur enjoy their sushi. The sushi(s) were a bit warm because it's made in seconds in front of us, and you don't need to dip in shoyu or add wasabi anymore because the chef already prepare it for you. Also, you are advised to eat them by hand directly, no chopsticks required, and then swallow the whole thing at once. Classy! What I've always dreamed of. A beautiful, beautiful piece of fatty tuna, a.k.a Toro in Japanese. Look at how appetizing it looks like, with shining dash of shoyu wiped right on top of the succulent flesh. Superb quality! Chef says, to make sure you have a tender flesh, octopus must be 'massaged' in about 30 mins to 1 hour before boiling. Lots of work and dedication were put onto preparing this meal. Hats off to 'em sushi chef! The result is, tako that just melts in your mouth, with sweet homemade shoyu wiped on top that gives extra kick and made you crave for more. Top notch! In between our sushi course, chef prepared crab/kani miso soup for us. The only drawback was, for me, that it tasted too salty. But the crab was fresh, though! Now, we all have preference. Some love raw sushi the best, but some people (like myself) yearn over 'aburi' style, in which cooking torch is being used to create half-burnt effect, giving your sushi the exceptional texture and aroma. Love this one! Just when I thought it was just "another salmon sushi", I kept getting surprises. Never thought that salmon with a dash of goma (sesame) and goma oil on top could bring out its maximum flavor! It just works... really well. Perfect combination. Told you I'm a big fan of everything-aburi. Looking at this all I want to do is buy cooking torch myself and half-bake everything by torching it. Super good. Rice roll with omelet inside. I reckon that this was served to put an end to our stomach capacity, lol. Great munching on this snack, too. This closed off our sushi parade that night. Truly delightful! AND FINALLY.. THE 18TH COURSE: MOCHI ICE CREAM. OH MY GOD DID WE JUST HAVE 18 MEAL COURSE? Well this is a sweet closing to end our Omakase journey that night. The green one is matcha (green tea), yellow depicts mango mochi ice cream, and finally purple represents taro/yam mochi. Perfect close down. So I guess that's a wrap. No more words. YOU JUST GOTTA TRY OMAKASE AT UMAKU YOURSELF. And then let me know how it went, how will yours differ from mine, what kind of random kindness & complementary bonuses that the chef gave you... ~ Trust me, you'll be surprised.